For the first time LIVE at the public in the theatre at the Marian gate in Duisburg. Malte Kruber, RTL Explosiv reported and there are free the comment by Dieter Bohlen. 112 Bricks in 60 seconds with Sidekick .Produce from Sophon Cable Tv.Thank you Paul. The professional spare parts specialist from April 2012 .we bring to your destination. www.Ebayzwei.com mt. So 2 x 4 cm aufeinanderliegende bricks were with each Sidekick L/r gebrochen.Keine spacers. 144 mm pine without Distanzstucke in the balancing act with the Super Talent 2009. 200 Hits in 35 seconds 5 7142 hits the SEC - MICKEY.TV -[Translate this page] www. 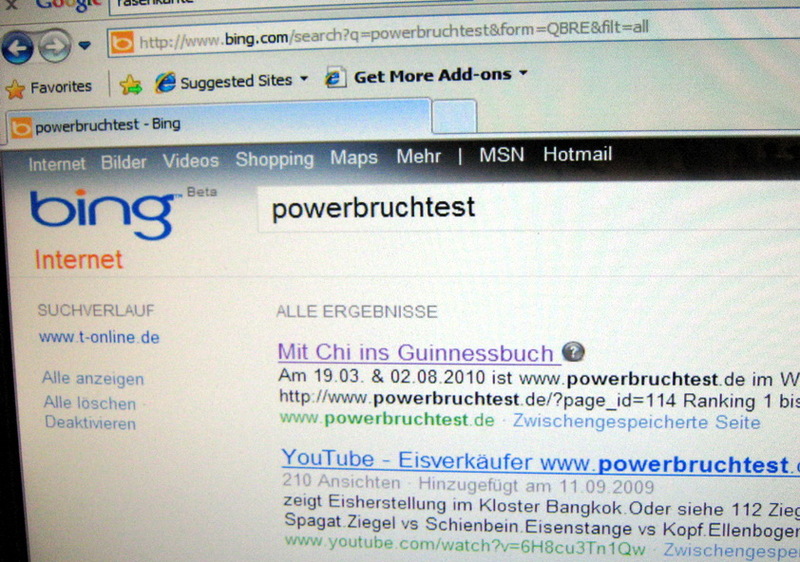 powerbruchtest. de x Hammerfist 50 x Palm, obtain 50 x, 50 x finger key shows 200 hits of the stone in 35 seconds. 50 = 200. Per second 5,7142 ..
Below more broken tests than 101 different videos are right. With pebbles, DIN concrete, bricks, iron wood. Death break test larynx vs. knife and pebble with 240 grams baking Fist in the Spagt. In the larynx vs break test rod M6 M8 M10 threaded rods are used as well as in the broken test Iron Rod vs Kopf.all rights reserved.Dazu page please see copyright. Video-Treffer: tag:”call 112″ sort:mostPopularThisMonth Stichwörter: formula one, call 112, powerbruchtest, formel1, sébastienbourdais … powerbruchtest.de (2) Supertalent 2009 (2) SebastienBourdais (2) ellenbogen ..
www.powerbruchtest ist am 16.09.2009 nicht nur auf Platz 1 bei Yahoo ,Deutschland sondern gleich 8 x auf Seite 1 .